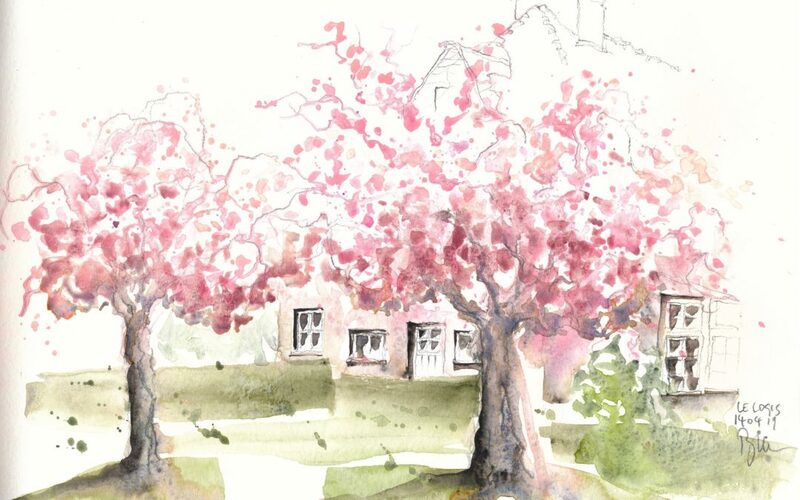 They were in full bloom last sunday, the big light pink cherry blossom balls on the old japanese trees in the garden town Le Logis Floréal in Brussels. In the 1920’s these trees were send over straight from Japan, when the garden town was finished. So I went sketching again, but the weather was very cold. I think in the video you see I’m cold and my hands are frozen in the end. then I draw the trunk and the branches of the trees in watesoluble graphite. I paint quick strokes of grass and bushes. They’re quite geometrical. Some bushes are less geometrical: those may be “splashed”. I love to splash. Careful for your clothes as some colours don’t wash off. I draw a part of the house. A lot is hidden behind the tree and that’s good. The trees are the main subject. The parts of the windows and doors that have shadow are drawn darker by pushing harder on the pencil. For the pinks I made a “blossom palette” with several kinds of pink. The main flowers in the sun are very light pink, but for the shadowy part of the tree I used darker pink like Potter’s pink. I used sable brushes, but you can use other brushes as well. 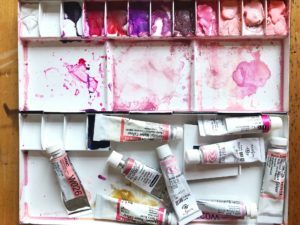 Here’s my pink palette. I made this last year when I went to Japan to paint cherry blossoms. I hope you enjoy the video and don’t hesitate to ask questions or give ideas that my help others in the comments below. Thank you so much for recoding your painting. I got several really good ideas from seeing you work. Oh Thank you so much Malinda !!! Don’t hesitate to share your insights.